Strong demand for high-end properties in Singapore means that property developers who build assets in that segment won't be affected by the island republic's measures to cool the property market. Singapore had put a 70 per cent cap on loan-to-property-value for second mortgages, among other measures, to prevent the market from overheating. Property developer Wing Tai Holdings Ltd deputy chairman Edmund Cheng said at the launch of its luxury project Belle Vue Residences in Singapore last week that the new curbs will not affect the group. "The measures are few but for genuine buyers it is still okay. It may affect upgraders. Most of our projects are upper middle, high-end and super high-end, so the impact is not much," he said. "Wing Tai will continue to launch new projects as there is pent-up demand for high-end properties, especially among international investors and home seekers," he added. Foreign buyers generally make up about 29 per cent of Singapore's property market, Cheng said. 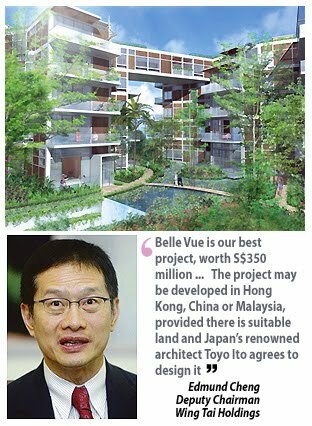 Meanwhile, Wing Tai may replicate Belle Vue Residences, its most valuable residential project worth S$350 million (RM812 million), in other Asia Pacific countries. The project may be developed in Hong Kong, China or Malaysia, provided there is suitable land and Japan's renowned architect Toyo Ito agrees to design it. Belle Vue was designed by Ito, whose free-flowing spaces and designs mirror the rhythms and patterns of organic growth. This is his first residential project outside of Japan. Some 62 per cent of its 167 units have been sold, mostly to international property buyers, at between S$2,000 (RM4,640) per sq ft and S$2,300 (RM5,336) psf. The project was launched in phases starting August 2008 and the remaining units will sell from S$2,300 psf to S$2,800 (RM6,496) psf. Cheng said he was confident that the project will be fully taken up soon. "Belle Vue is our best project but we are aiming for another best development," Cheng said. Belle Vue, located on Orchard Road, is designed to parallel nature's simplicity.